This luxury 1 bedroom apartment is in a magnificent Georgian town house located right in the city centre on Queen Street. It is on the second floor (up 2 flights of stairs) of this 18th century building and offers spectacular views across the north of the city and over the Firth of Forth to Fife. One enters the property into a magnificent entrance hall with wood panelling and a feature cast iron stair balustrade. The bright, spacious sitting room has a gas fire, leather sofa and two double sofa beds double. A large dining table is provided with seating for 6 so entertaining is not a problem. The bedroom is well furnished and has large fitted wardrobes and a queen-size bed. The kitchen is well equipped with dishwasher, washer/dryer, gas stove and electric oven. The bathroom has a power shower over the bath. Wifi internet is provided. Parking may be made available on request for an additional charge. Queen Street is right in the city centre being located just behind George Street, one of the city's most important shopping streets. This means that you are within a few minutes walk from some of the best shops, restaurants, bars and tourist attractions that Edinburgh has to offer. There is the added bonus of being able to look out over the tree tops in Queen Street Gardens (a key is provided for the gardens) and beyond is the Firth of Forth so you practically have a "sea view"! 50” flat screen tv in the living room and an additional tv in the kitchen. A key for the private Queen Street gardens across the street is provided. Parking may be made available upon request at an additional charge. Comfortable, centrally located apartment, with a great view. Francois met us at The apartment, explained the amenities , and gave us some useful information on the local area. The main living area is large and comfortable, with a great view over the Queen Street gardens and also has a sea view; albeit fairly distant. The kitchen is very large and well equipped. Although there was some traffic noise, we were not disturbed at all at night (even after the Scotland Wales rugby international!) and slept well in the comfortable bed. The apartment, and the building as whole, has a grand feeling about it, and is well placed for the numerous local restaurants and bars in the New Town. We would not hesitate to book again. Charming, great space and a great place to stay. Owner met us on arrival and was very helpful. Wonderful flat, great location! Unfortunately we were there when they were paving and lining the street, so a fair amount of night noise. Did not stop us from completely enjoying the city and our vacation!! Yes it was a shame about the road works coinciding with your stay. One of those exceptional circumstances but the work has been completed. Large. Bright. Faces Queen Street Gardens. Can see the water. Clean. Comfortable. We stayed for 7 nights. The flat is nicely furnished, comfortable and spacious. And it was nicely cleaned on our arrival. The kitchen is nicely equipped. There’s an amazing view of the private gardens and the sea by Leith. Access to the private garden was a unique bonus. We especially enjoyed the unique Scotch tasting available next door at the Single Malt Whisky Society restaurant: Kaleidoscope. 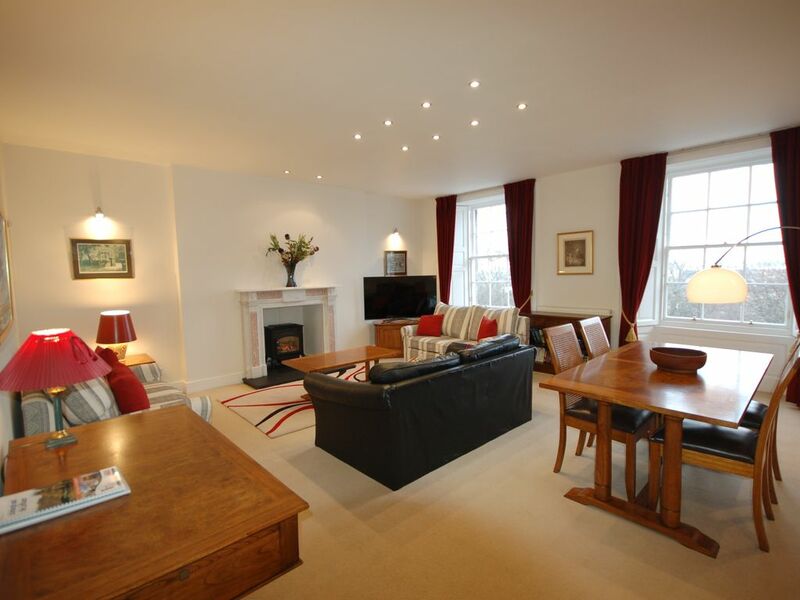 The flat is an enjoyable 15 minute walk to Royal Mile attractions. We did not have any problems with the stairs and found they got easier as the week progressed. This really is right in the city centre, being in Edinburgh's beautiful New Town, a 2 minute walk from the main shopping streets, George Street and Princes Street and being surrounded by most of the city's best bars, restaurants and tourist attractions. Rates may vary depending on special events/holidays and on the number of people staying. Discounts will be applied if your dates fit in well with our other bookings or if you are looking for longer a stay. Credit and debit cards are accepted (2% charge).